The Lunchbox World Blog: Inspiration for your lunch box: How to Liven Up Lunch the Warburtons Way! How to Liven Up Lunch the Warburtons Way! Last night a small hamper of goodies arrived on our door step delivered by a friendly biker down from town. The mission if we decided to accept it: to pack a fun lunch with Warburtons goodies! 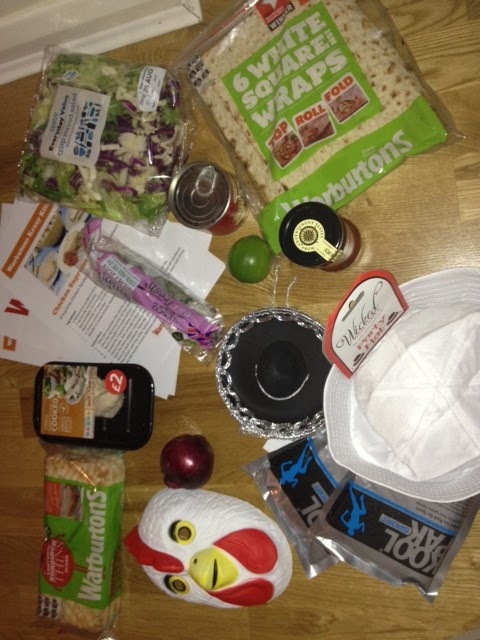 Here's a snapshot of what we received along with a couple of recipe ideas to follow and some silly fun hats to wear whilst preparing our lunch! The kids took to it like a duck takes to water! We love the Warburtons thins, they're sliced in two for easy packed lunch preparation and we promptly filled our sandwiches, ready for lunch today. Having prepared the ingredients above, take two sandwich thins and open up on the worksurface or chopping board you are using. Put the top halves to one side temporarily. Place the slices of chicken on top. Then the rocket leaves on top of the chicken. Then take the top halves of the sandwich thins that you placed to one side, and close your sandwiches. We secured ours together with cocktail sandwiches and cut into triangles a bit like club sandwiches. We were sent other recipes to try such as the Tex-Mex Mayhem and the Tuna Trawlermen. We'll explore these recipes another day! If you love watching these out-takes, then hop on over to the Warburton facebook page to view the families in their head to head challenges on who can have the most fun in the kitchen preparing lunch! So what tip would you share for packing a fun lunch? Disclaimer: all thoughts are our own. We had lots of fun.